Put three mighty Cuban percussionists together at any time and a fire is bound to be lit. Put three mighty Cuban percussionists together at any time and the unquenchable fire of creativity is bound to be lit. Something happens to the men who seem to share a joie de vivre that is infectious. Perhaps the Descarga enflames the music so that a veritable percussion forest fire spreads into the music uncontrollably. 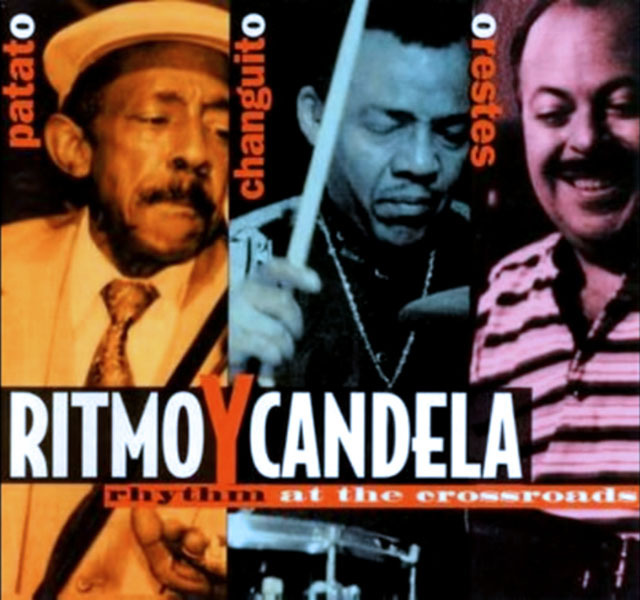 Happily this is exactly what happened at this session entitled Ritmo y Candela – Rhythm at the Crossroads featuring the great conguero Carlos “Patato” Valdés, trap drummer and timbal master José Luis “Changuito” Quintana and that other great timbalero Orestes Vilató. Another reason why this album shines brightly is because it is superbly produced by Greg Landau, who is known for his Midas touch, which we have been witness to time and time again. The mastery of these musicians is unsurpassed. It has been for decades. Mr. Landau has capitalized on this writing music to their individual styles and strengths. Listen to any track and you will hear what I mean. But if you want the full force of the Afro-Cuban music by these legendary masters to echo in your very soul, then Desde El Fondo Del Rio is a very good example. It is ancient and it is modern, and other musicians excel as well. In particular Rebeca Mauleón is outstanding as is bassist Joe Santiago whose guttural notes propel the music into an amazingly rarified realm, Ms. Mauleón’s synthesizers adding mighty harmonics to the music. Her command of the idiom has always been considered impeccable. Here Rebeca Mauleón sounds almost muscular and her playing is beautifully bereft of feminine signs, metamorphosing instead into something of sinewy machismo and yet decorated with unsurpassed gracefulness. This album rockets to any list of essential albums. The writing, however suggestive that might actually be, is something to behold. Moreover the musicians hold fast to their individual voices in such a manner as to bring fabulous individuality to the project. And yet each song is practically and stunningly different from what came before it. This has everything to do with the spectacular soli. On Luz, for instance it is the turn of Orestes Vilató and Enrique Fernández to put their arts on display. Breathtaking soli ensue and this is followed by the perfunctory ingenuity of Patato, who seems to be the star of the session. This does not mean that Changuito and Vilató are not part of the celestial triumvirate. Instead the three percussionists feed off each other’s vitality. Special acknowledgment need to be mentioned of Enrique Fernández, who contributed to the exciting and visceral writing and this ought not to go unnoticed. Apart from being a fine instrumentalist Fernández is also an extraordinary composer and arranger. And then is the ineffable Rebeca Mauleón. No words of praise are high enough for her contributions to this album. Fortuitously this date produced such music as to be honored by a nomination for a Grammy Award for Best Latin Jazz Performance in 1996. And then there was also a follow-up date which also produced the superb African Crossroads. Together these two albums make up an essential part of every Latin Jazz library. Track List: San Francisco Tiene Su Propio Son; Descarga En Faux; Desde El Fondo Del Rio; Luz; Yo Tengo Ritmo; Oguerre; Calipso En Las Nubes; Güiro Para Ogún; Los Maestros Hablan. Personnel: Personnel: Carlos “Patato” Valdes (congas); Jose Luis “Changuito” Quintana (drums, timbales); Orestes Vilató (timbales, bongo, percussion, guiro, bell); Rebeca Mauleón (vocals, piano, synthesizer, chekere); Felix “Fito” Reinoso (vocals); Enrique Fernández (alto, tenor & baritone saxophones, flute); John Calloway (flute, synthesizer); Greg Landau (guitar, tres); Joe Santiago (bass); Jeff Narell (steel drums); Michael Spiro, Edgardo Cambon (chekere, background vocals); Lazaro Games, Lazaro Bages, Ollan Christopher, Tammy “Omi Ade” Ozier, Christina “Ochún” Velasco (background vocals). Some time ago I interviewed Orestes Vilato and I mentioned Rhythm at the Crossroads. Here’s what he had to say, “Do you know how that recording was made? We went into the studio with no preconceived ideas of what we were going to do. We laid down the percussion tracks and later; flutist John Calloway added the arrangements.” Kudos to John Calloway and pianist, Rebeca Maueleon. Rhythm at the Crossroads and the follow-up are two of my favorite albums of all-time. Also, a compilation that includes the best of both albums is available. Excellent piece Raul, thank you.